Tools enable your team to efficiently and consistently generate work products that meet established standards. The Rule of Tools is: have everyone on the same systems (and versions), no matter what. This rule may mean that you choose simpler tools rather than complex/powerful tools. You may have to provide tools to team members for the length of time required to get the job done. The price of the time and effort required to create and manage work-arounds is just too high. If team members cannot access your document repository or participate in on-line meetings, you will have trouble staying on schedule and may suffer a loss of quality in your finished product. What types of tools does your virtual team need? 1. Basic information technology (IT). Each team member needs a telephone, high-speed internet access, computer, print and scan capability, and basic software. 2. Communication tools for individuals and groups. Ensure that your team roster includes email and phone contact information for all participants. Because clear communication is key, develop a communication chart/tree so that everyone knows who to communicate to and how to escalate issues and questions. This prevents unintentional sharing of proprietary information and miscommunication between uninformed parties. This communication tree is especially important when many partners/subcontractors/etc. interact on the effort. Commonly used web-based tools provide conference calling (voice or voice and video) and document sharing functions. Also, develop a team calendar that everyone adheres to and updates. 3. Collaboration and content management tools. Your document repository is critical as the central, continually viewable collection of current work products that serve as the “masters” for quality and progress evaluation. Many tools are available to provide repository, version control, sharing, editing, and reviewing functions. 4. Document development and formatting tools. MS Word is a sufficient document development and formatting tool for many teams. For page-limited documents with graphics, a great alternative is InCopy, the writer’s and editor’s portion of InDesign, the program used for desktop publishing. InCopy is easier to use than Word because graphics and tables do not “float” in the layout, and authors can see their page limit status real-time. 5. Templates. High quality samples give team members standards for formatting and content. Accurate templates provide specific direction, save time, and increase product quality. 6. Libraries. Background and source material may be useful to your virtual team. Solicitations, solution development artifacts, resumes, past performance information, and previous proposals are valuable library artifacts. For a proposal team, make the capture library available to the team (see the XPRT blog “How to Develop a Good Capture Plan” for capture library contents). 7. Administrative tools. Tools for status reporting, time-keeping, and expense reporting have made these tasks simple for remote workers. You may also consider VMWare, which provides a virtual desktop. A VMWare solution could be used to provide all the tools needed for the job, or could just provide access to document storage. A complete virtual desktop ensures that everyone is using the same versions of all tools. The disadvantage is the expense for licenses. Focus on tools before the effort is under way. Establish your tool budget, procure your toolset, and ensure as each person/partner joins the team that every team member has access to the tools and training. Do not assume that everyone has, or has access to, all the latest and greatest tools. Do not lose precious time while new team members sit idle, waiting for access requests to be fulfilled; streamline this process so that new members have immediate or near-immediate access. Provide technical support, 24/7 if your team is on a tight timeline. Arrange for frequent and consistent backups, so your team only loses a few hours’ work if there is a power or equipment failure. Solving the tool problem early saves valuable time, puts all team members on equal footing, and maximizes individual and team effectiveness and productivity. Once the toolset is established, the same tools can be used repeatedly. Strive to have key contributors meet as a group at least once before your effort begins, and again periodically if it is a long-term job. Meeting in person helps improve teamwork and builds trust. At the first meeting, demonstrate how the tools are used, ensure that everyone has access to the tools, and provide training if needed. Develop a turnkey onboarding process so that people can quickly come up to speed and be productive. This onboarding includes a project/proposal plan, organization chart, roster with contact information, schedule, background materials, deliverable requirements, IT requirements, administrative processes and policies, and who to contact for answers to questions. It should be clear to each person who they report to, what their job is, how to escalate questions and concerns, and how to get help. Whether communicating with individuals or groups, effective communication processes are critical to managing virtual teams. Email. Improve the effectiveness and efficiency of your emails. There are plenty of suggestions on the internet for writing better emails. The book “The Hamster Revolution: How to Manage Your Email Before it Manages You,” by Mike Song, Vicki Halsey, and Tim Burress, contains great suggestions on how to write fewer emails, write better emails, and file/manage email to make yourself and your team members more productive. Scheduling meetings. Schedule meetings with care. Invite only those who are needed, as soon as possible. Be sensitive in scheduling meetings that have participants in multiple time zones. Establish team core hours, when everyone is expected to be available for calls. Avoid spending time in meetings when you can be performing the work. Establish a consistent meeting schedule and stick to it. Avoid any pressure to cancel regularly scheduled meetings (daily standups, weekly reviews, etc.) due to customer requests, out of a belief that doing so saves money, or when updates/news are limited. The established meetings are team members’ opportunities to raise issues, talk through the nuances of the effort, and grow as a team. Teleconferences and videoconferences. Establish agendas ahead of time. Have an order for people to speak and a process for participants to offer spontaneous input. Depending on the tool you are using, you may give participants the ability to type a question or comment so the host can see it in real time and address it when appropriate. This process helps keep people from talking over others or talking at the same time. Solicit input and make sure everyone is paying attention. Ensure that each manager has a separate teleconference/videoconference number to allow managers to schedule small team meetings that do not conflict with the use of the main conference number. Open conference calls 10 minutes before the scheduled time, to ensure meetings start on time. For video conferences, post the first slide or document after opening the call to alert participants immediately that they have joined the call successfully. Personal Check-in. This practice is the virtual equivalent of management by walking around (MBWA). Virtual team members may require extra effort to avoid isolation. Consider a daily one-on-one call with each of your direct reports, no longer than 5 minutes. Each manager in your organization can do the same. When it comes to managing work, virtual team members require more attention to detail and greater self-discipline than co-located team members. 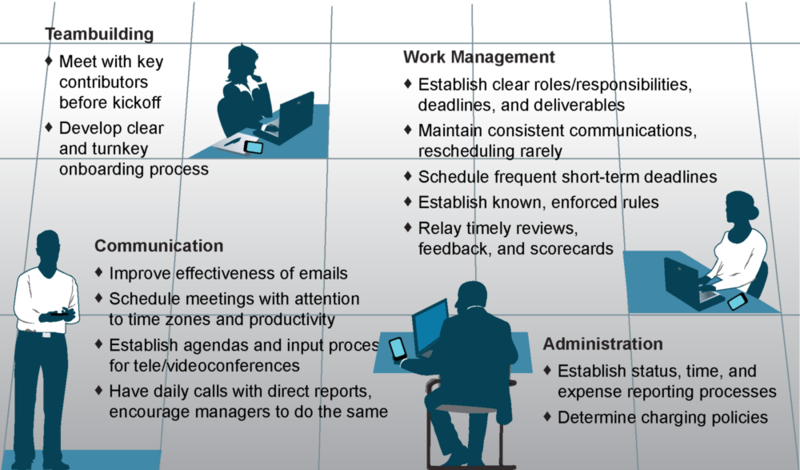 Successfully managing the quality and schedule of a virtual team has four components. 1) Clarity. Establish clear roles and responsibilities, clear deadlines, and clear deliverable requirements. Provide accurate templates and high-quality samples of deliverables to give an objective model of what is expected. 2) Known, enforced rules. Online collaboration is key to success, and everyone must follow the rules of engagement. For example, on a proposal, each writer must post their work in progress to the repository every time an update is made, and at least daily. Writers who hoard their work on their hard drives until it is “perfect” (or until they run out of time) are detriments to virtual teams, and risk losing work if their personal system fails. 3) Frequent short-term deadlines. Require each contributor to frequently provide a deliverable product for review. This will give you the information you need to accurately assess progress and provide feedback. 4) Timely reviews, feedback, and scorecards. Arrange for contributors to receive rapid feedback on work in progress. Track the progress of each section or part of the work, so you know exactly how your project or proposal is taking shape. In addition to establishing standard processes for status reporting, timekeeping, and expense reporting, you must establish policies for how to charge time when people work remotely. For example, if a writer submits a draft and must wait by the computer for comments before continuing work, is the wait time chargeable? Choosing the right people is especially critical when working virtually, because you may not have opportunities to coach them face-to-face if you require better performance from them. People who work well in a virtual team environment share the characteristics shown in the graphic. At XPRT, we co-locate new people on one or two efforts before we ask them to work remotely. This ensures that they possess the characteristics described, know our processes, and can perform to our expectations. Managed correctly, virtual teams are productive, efficient, and cost-effective. XPRT can provide the right tools, processes, and people to accomplish your virtual project, proposal, or review. We ensure that all team members have the tools, information, and management they need to produce high quality work on schedule, no matter where they are located. Teresa Davis, CF APMP, is a senior desktop publisher, conceptual artist, graphic designer, and proposal volume manager. She is an expert in the development, review, formatting, and publication of documents in a virtual team environment, and is XPRT’s leading tools guru. Contact her at Teresa.Davis@xprts.co. Kim Haynes, CP APMP, is a senior proposal manager with more than 30 years of experience managing programs and proposals for Federal, state/local, and commercial customers. Leading winning proposal teams makes her happy. Contact her at Kim.Haynes@xprts.co to share the joy. Dr. Lisa Hoverman, APMP, CPHIMS, is a bid strategist, proposal manager, and sought-after medical, scientific, IT, and systems engineering technical writer and editor. An expert at managing virtual teams, she brings both academic and business perspectives to help clients solve complex business problems and grow. Contact her at Lisa.Hoverman@xprts.co. Nancy Naumer, APMP, is a conceptual artist, graphic designer, desktop publisher, and oral presentation developer and coach. She creates winning graphics using Adobe Illustrator, Photoshop, InDesign, and PowerPoint. She is an expert in visual thinking and adept at working in virtual teams. Contact her at Nancy.Naumer@xprts.co. For a free XPRT consultation to assess what your business needs to grow, or for more information, contact XPRT at (844) 332-9778.